NOTE: The Sensafe Exact Micro 7 Copper Test Strips 486632 12-Pack is discontinued and no longer available. 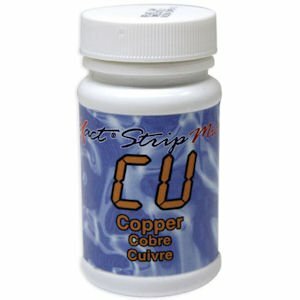 Please consider ITS 486632-25 Copper Water Test Strips 12-Packs as a suitable replacement. These Copper Test Strips 486632 are used in the Sensafe Exact Micro 7 Photometer and in other water testing micro meters. Spa and Swimming pool owners should test for copper in pool water regularly to ensure their copper level is not over the maximum level of 1.0 ppm. When the copper in pool water exceeds this amount, it can cause green water that will stain pool walls and even hair and fingernails. Proper pool water testing for copper can help you prevent these unsightly stains.